Dawson Bonneville will present his work on UV laser written waveguides at CLEO 2019. His results were also recently published in Optical Materials Express. Welcome to the group Hamidu Mbonde and Dr. Renjie Wang! Henry Frankis recently presented his work on tellurium oxide microcavities at Photonics West in San Francisco, Feb. 3–7, 2019. Congratulations to Chenglin Zhang on successfully defending his M.A.Sc. thesis! Henry Frankis presented his results on four-wave mixing in integrated microcavities at the Conference on Lasers and Electro-Optics (CLEO) in San Jose, CA in May. Khadijeh Kiani presented her work on FIB facet milling at the 11th Annual FIB-SEM Workshop in Hamilton, ON (April 30-May 2). Henry Frankis presented his work and Dr. Bradley gave an invited talk at the 7th International Workshop on Photoluminescence in Rare Earths: Photonic Materials and Devices (PRE’17) in Rome, Italy, Nov. 2017. ​Congratulations to Jeremy Miller who published his work on a novel thin film deposition method in Surface and Coatings Technology. D. B. Bonneville, M. A. Mendez-Rosales, H. C. Frankis, L. Monteiro Goncalves, R. N. Kleiman, and J. D. B. Bradley, “Flexible and low-cost fabrication of optical waveguides by UV laser resist-mask writing” Optical Materials Express 9(4), 1728–1737 (2019). H. C. Frankis, K. Miarabbas Kiani, D. Su, R. Mateman, A. Leinse, and J. D. B. Bradley, “High-Q tellurium-oxide-coated silicon nitride microring resonators​,” Optics Letters 44(1), 118–121 (2019). 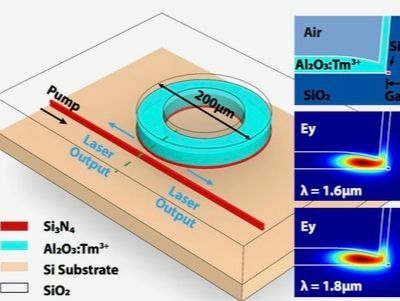 H. C. Frankis, D. Su, D. B. Bonneville, and J. D. B. Bradley, “A tellurium oxide microcavity resonator sensor integrated on-chip with a silicon waveguide,” Sensors 18(11), 4061 (2018). ﻿Our group is always looking for motivated, enthusiastic and highly qualified students who are interested in photonics. Please contact Dr. Bradley about available Undergraduate, Master's and Ph.D. projects.